Today's post is coming to you from the magical city of London; oh how I love this place. Feels like my second home, actually! 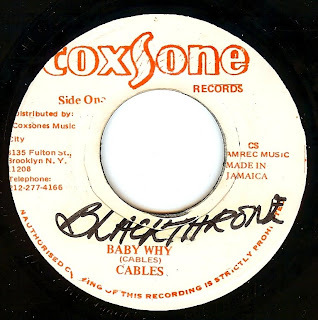 As I was deciding what to post, the first thing that popped into my head was the Jamaica to UK music connection and the importance of blue beat and reggae on the UK underground of the late 60's. Thank you, England, not only for keeping soul alive! 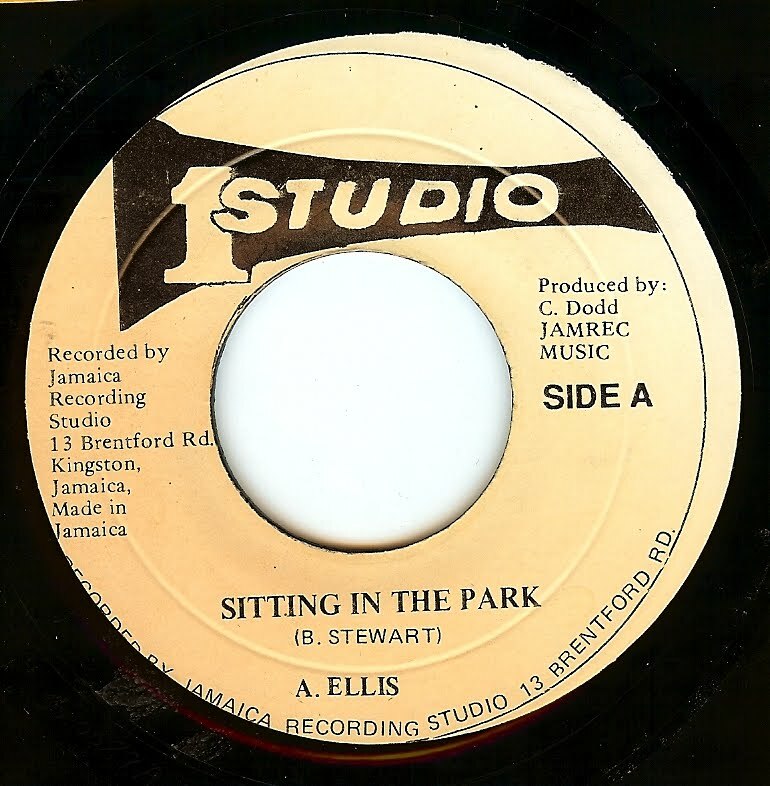 This is a beautiful, haunting version of the Billy Stewart classic done to a perfect lilt from Alton Ellis (strangely listed only as A Ellis on the label of my copy, but when it comes to Jamaican pressings nothing is a surprise). From Trenchtown, Alton was one of the very first Jamaican vocalists to cut a side (his first release was cut in 1959) and is generally acknowledged as one of the finest singers ever from the island. This cut helps substatiate that claim, as his smooth, pitch perfect delivery is a thing of wonder. 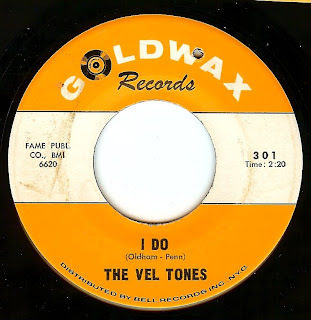 Hailing from Wilkes Barre, PA and with a background in gospel, doo wop and rock n roll, singer Mel Wynn hooked up with a pre-existing group called the Rhythm Aces in the mid sixties and had a career as a live act for over a decade and cut a few singles as well. Sometimes I feel as though I run out of adjectives to describe these records; what more can be said about a side like this other than it is absolutely glorious and it's the type of music that makes it great to be alive? 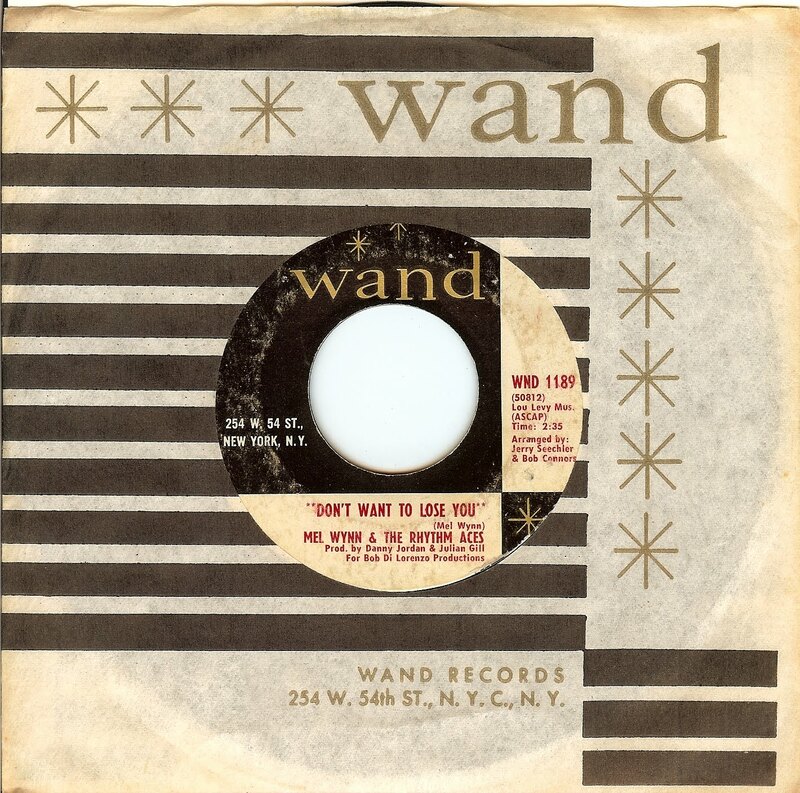 First off, I have to give some major props to two friends in regards to this record; first off, Eric Colin played this at Mod Chicago and hipped me to it. Luckily, another friend and excellent DJ from Milwaukee WI, Dave Monroe, had a duplicate copy he was able to hook me up with. Thanks a million, amigos! Hailing from Jersey City, NJ, we find the Manhattans years before their massive hit "Kiss & Say Goodbye" with an ultra cool, slow burning winner. This was the second release from this LONG running group who are, in one form or another, still active today. 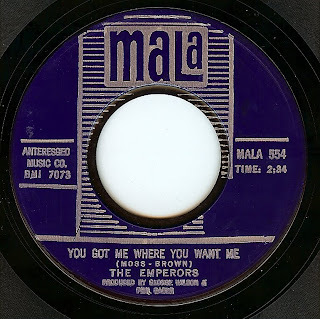 Hailing from Harrisburg, PA, the Emperors released a scant four singles during '66-'67 (one of the first records featured on this blog was their debut single, 'Karate"). Admittedly, I had practically forgotten about this great double sider until it (fortunately!) came up on random itunes play while I was on an airplane. 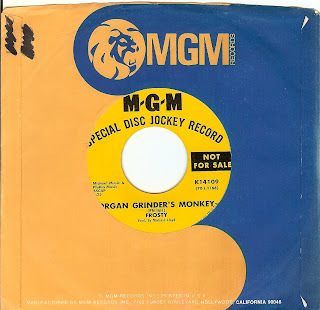 Both sides have a fantastic, raw sound and feel- although their version of "My Baby Likes To Boogaloo" is far more restrained than Don Gardner's original version (itself a past 45 of the day, and honestly, record's simply don't get rawer than Gardner's!). Featuring an out-of-this-world string arrangement courtesy of Allen Toussaint (not to mention the always excellent vocals of Ms Thomas), this slice of positivity seems the perfect song for a Monday. 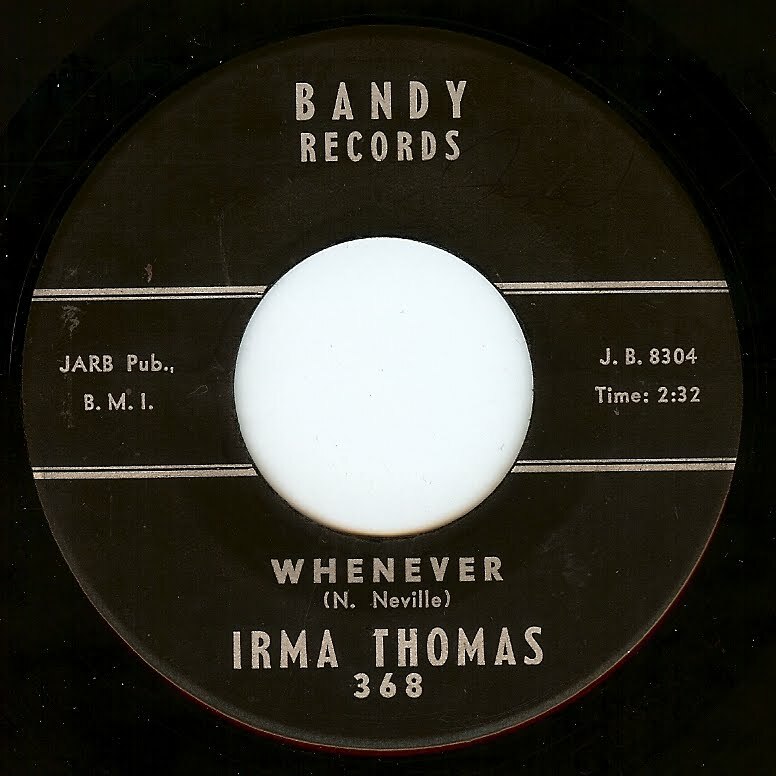 This record is also an excellent example that shows how New Orleans music was such a huge influence on the Jamaican lineage of bluebeat>ska>reggae that was developing at the same time, taking massive inspiration from the NOLA soul/r&b scene. Just learned that legendary music figure Harvey Fuqua has passed away; he was 80 years old. 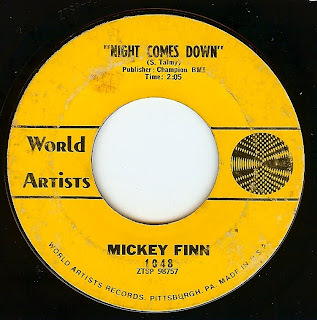 His career spanned from the doo wop years and beyond (including his performance of "Ten Commandments Of Love" with Harvey & The Moonglows which is one of the all time classic doo wop records). 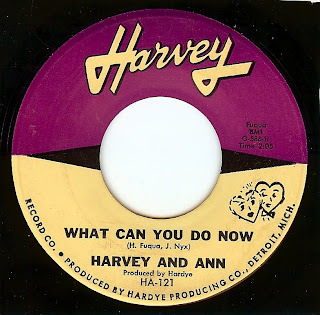 Getting his start at Chess records, (not only with the Moonglows but also working with Etta James early on) before relocating to Detroit in the late fifties and helping out to establish the Motown empire, Harvey seemed to have a pulse on the next big thing for many years. 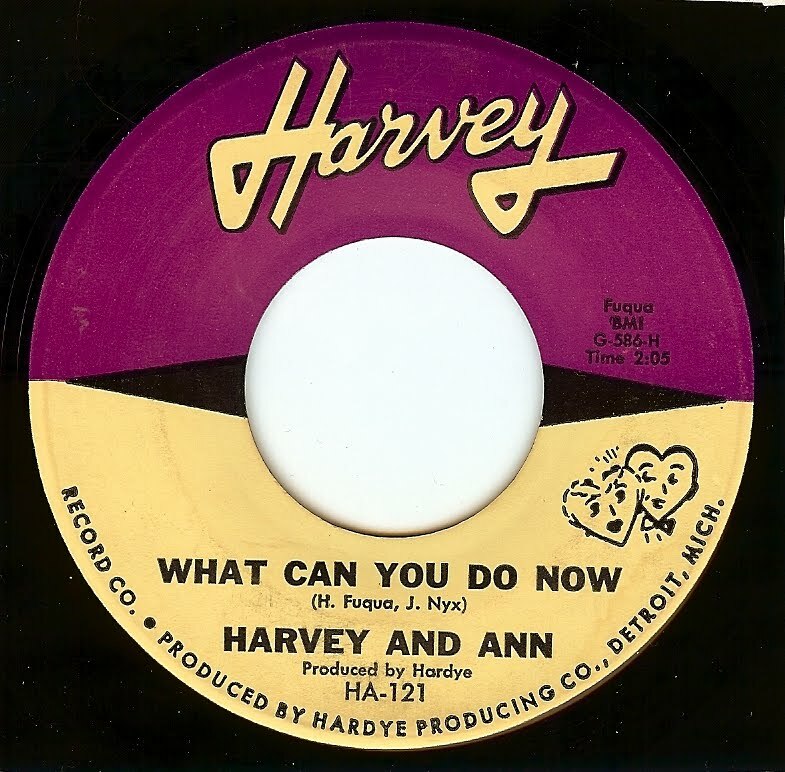 Here we find Harvey in duet with Ann Bogan for an excellent hard hitting r&b number. Yes, I know; I typically feature more low key records on Sundays, but this one just seemed RIGHT as a salute to Harvey. Here we hear from dynamic duo Barbara & Brenda again, with a stomper that is an excellent raised middle finger kind of song that stands up to the one doing wrong and says ENOUGH. 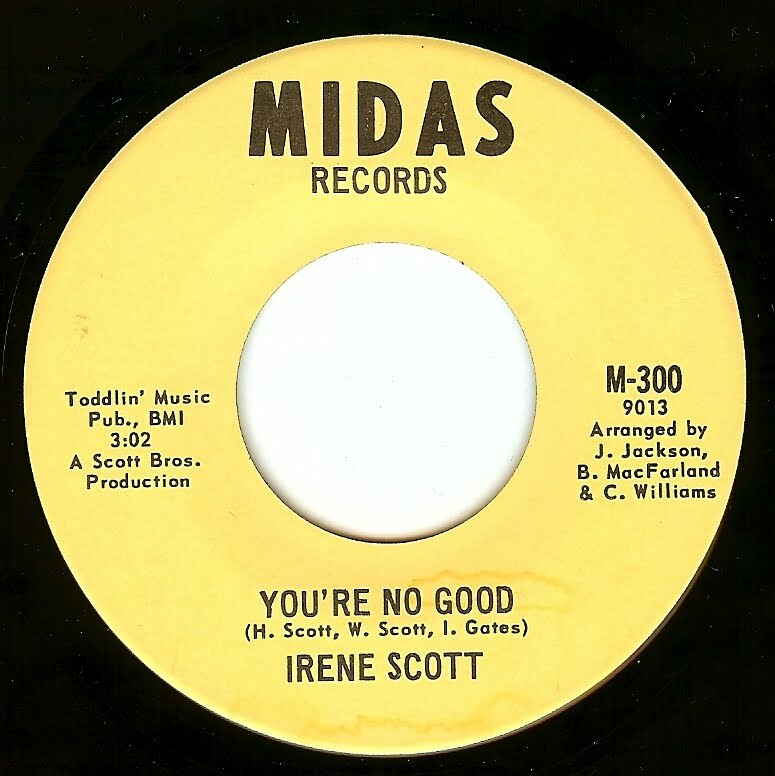 I love these records where the lady stands up and puts the man in his PLACE. 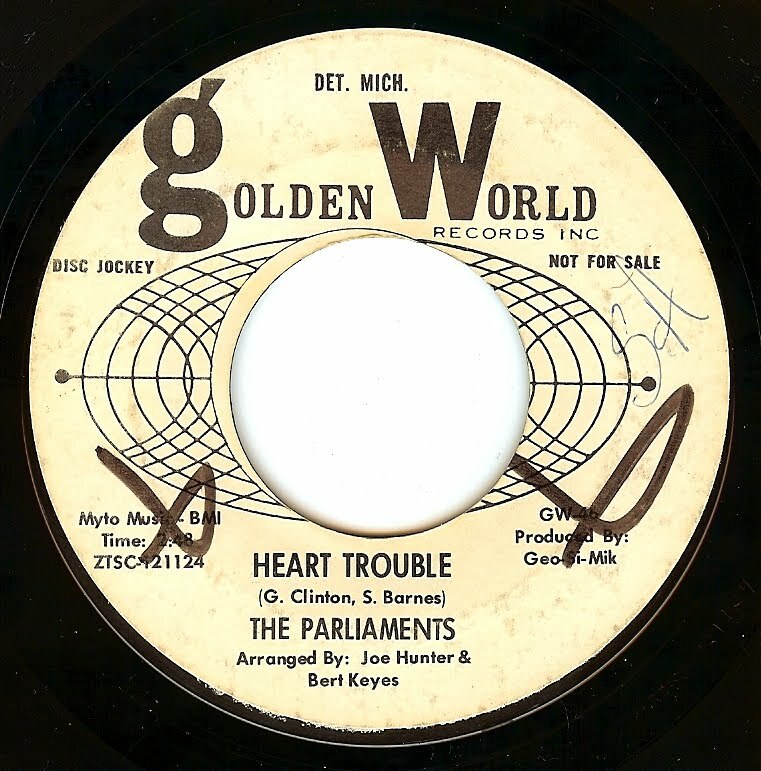 After a gap of around five years, George Clinton decided to revive the name Parliaments; the music scene had changed significantly during this relatively short time which is reflected here (previous Parliaments releases were doo wop, this record is, to my ears, the epitome of Detroit soul). 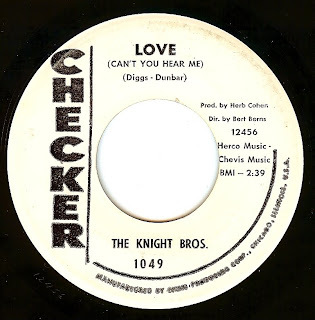 With his fingers in production, writing and performing pies, Clinton was one of the major players on the outside-of-Motown talent pool throughout the mid to late sixties (many of which have been featured as past 45's of the day, and many are on my want list as well, waiting for their future slots). Written (and probably produced by as well) Detroit genius Norman Whitfield (writer of oodles of classic Motown tracks as well as the acknowledged "inventor" of psychedelic soul), this record is a bit of a mystery. 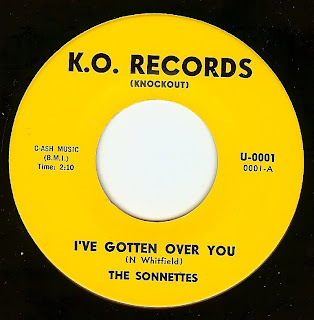 One would think that information would be readily available on a record with the involvement of one of Detroit's major figures, but all that seems to be known is that the two releases on the KO label were both by the Sonnettes (this is the only one I've heard). 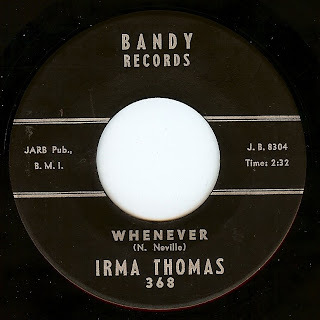 A delightful track that reminds me of early Mary Wells (kinda like "Beat Me To The Punch"), this is a record that should have been a hit; perfect arrangement, catchy song and sublime vocals. I am taking a wild guess at the year. As always, if anyone knows more, please do me a favor and write. A veteran of not only numerous gospel groups but also the Korean War, Vernon Garrett has had an incredibly interesting career at the very least. 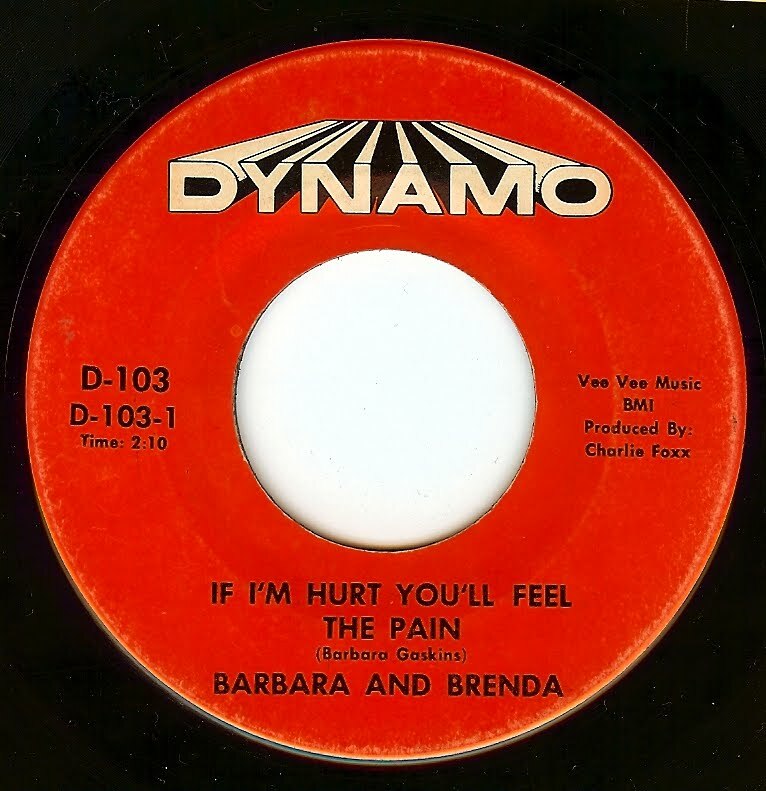 Sadly, this L.A based singer lost his wife and singing partner Jewel to cancer in the mid 60's which set his world into a tailspin; however, this great record captures that magical male/female duo sound. Little is known about Marie Franklin, although I know she cut a few more sides for Ray Charles' Tangerine label. Recorded at the tail end of the sixties, this style was on it's way out of vogue but it's a style that has stood the test of time so well. Here's some New York City Latin soul uploaded at the Swiss/ French border by a California dude that was almost uploaded while on a bus equipped with wi-fi cruising down the autobahn. Unfortunately, the wi-fi kept drifting in and out so I wasn't able to upload the track but better late than never, right? How's THAT for a truly international experience? 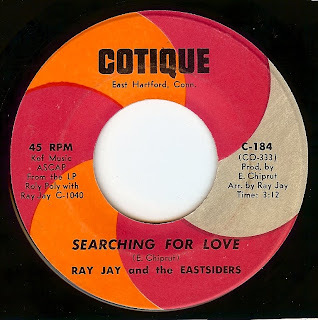 From the height of the boogaloo era, this funky-as-all-get-out Latin soul/ fusion track is a real gem. I've been writing and blogging from the road for the last few weeks, and today I'm writing from Ostrava in the Czech Republic. Practically everything is closed on Saturdays and Sundays (except the bars) and while I was pondering THAT situation this old favorite came to mind. I was convinced that I must have featured it at some time in the past but luckily, I have not. Just the perfect song for today, I reckon. 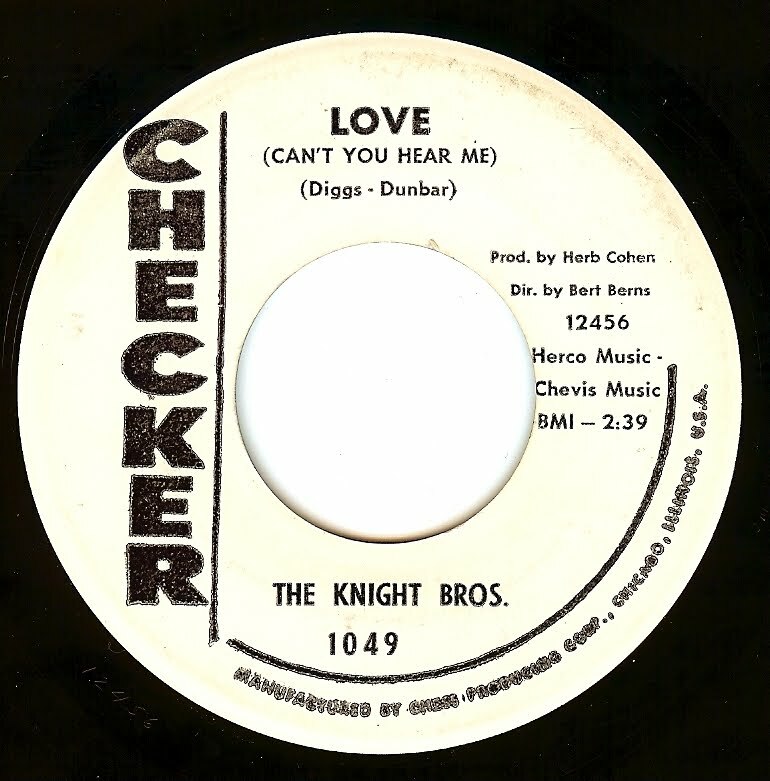 Working as a session man in Los Angeles (where he relocated to in the early 60's), this single was Haywood's first charting record on his own. His mighty "Baby Reconsider" (a past 45 of the day) was also waxed around this time. While Freddie's discography contains some of the most beautiful deep soul tracks ever cut to wax, here we find him belting out an absolute STOMPER! The type of record that hooks someone like me within five seconds and leaves me shouting MORE!!!!!! Fully psychedelicized by his trip(s) to and in San Francisco, here Eric Burdon tips his hat to those SF perennials name checked in the song (I will keep my opinion to myself about the Dead, but I will say that THIS song rocks harder and is way funkier than anything the name checked band ever noodled away at). 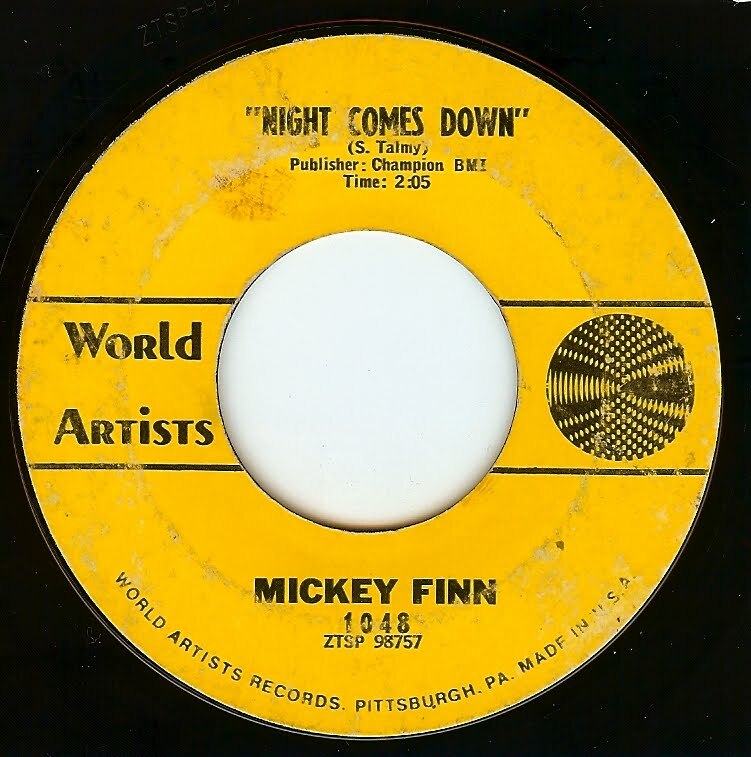 This gem was released only as the UK b-side to San Francisco Nights (warm San Francisco nights? They simply don't exist, Mr Burdon). 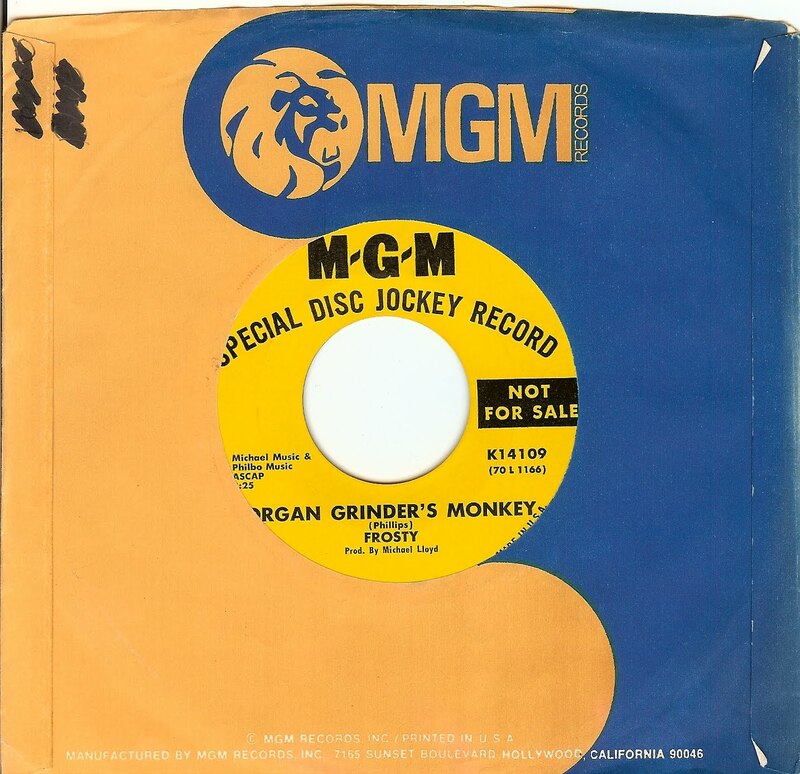 I know, I know- this post is far more cynical than usual for me but I truly love this fuzzed out jem of a jam (as well as most of the rest of the Animals catalog BEFORE this era). We last heard from Irene Scott a few weeks back on a record cut as Irene & The Scotts. While this one doesn't hve the manic energy of that particular record (and few others do!) this lovely double sider shows another side to this excellent and relatively unknown Chicago singer. I'm only guessing at the year; this record is almost completely undocumented. 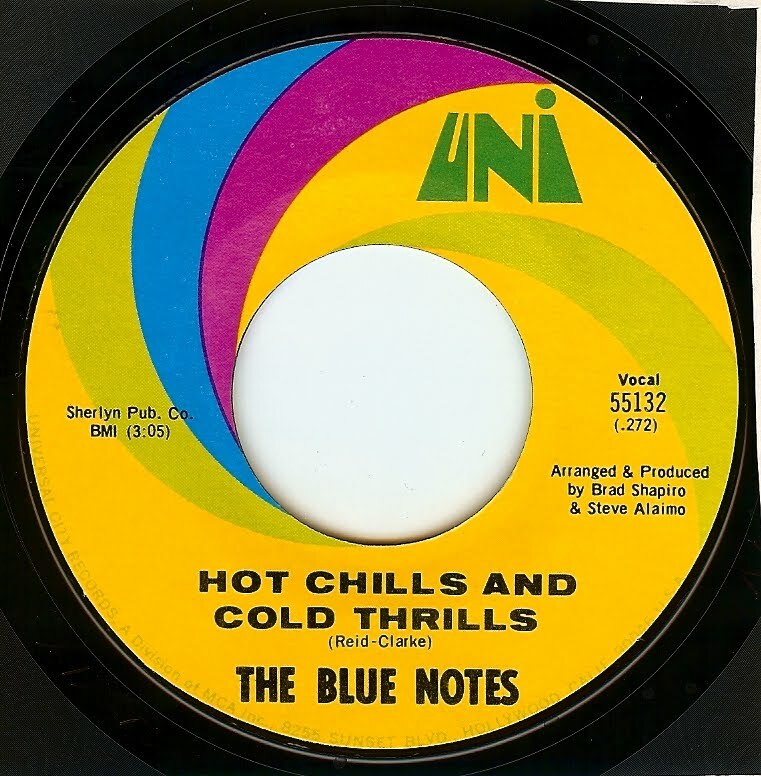 While listening to this track, there's no doubt that this is the same group that was uncredited as the backing of "Tighten Up" by Archie Bell & The Drells. Their name came from Texas State University, and that veritable road kind sport sedan, the Oldsmobile Toronado. This is a great track that has the same type of laid back but tight as a snare drum rhythm and superb horns that has made "Tighten Up" such a classic. 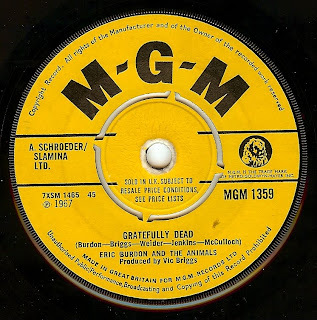 As I was looking through my available files for today's selection (I am currently out on tour and have a cache of scans and MP3 files for posts. Thank you, laptops and wi-fi! ), I realized that the legendary Billy Stewart has been VERY underrepresented on this blog. 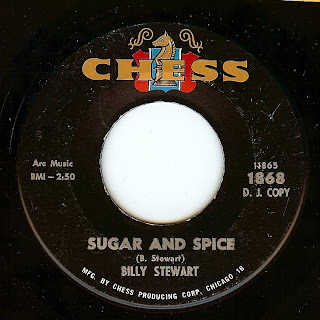 While Billy's career met a tragic end in 1970 (auto accident while on tour) he was lucky in his lifetime in that he scored some crossover hits (well deserved) with his incredible vocal stylings. 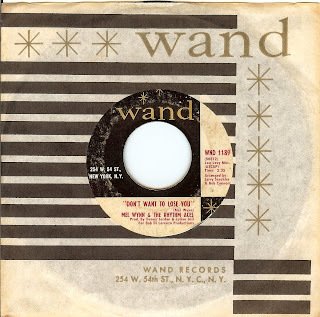 Starting out in Bo Diddley's band while still a teen, Billy cut a few strange sides between '56-'57 and then was absent from recording for five years. 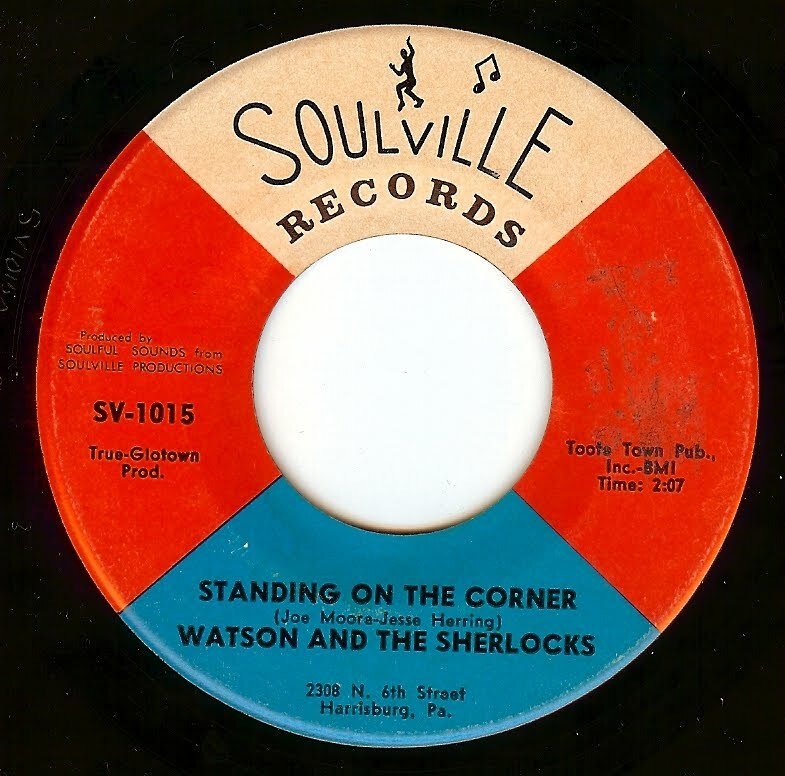 This side was cut during his first session back at Chess records. 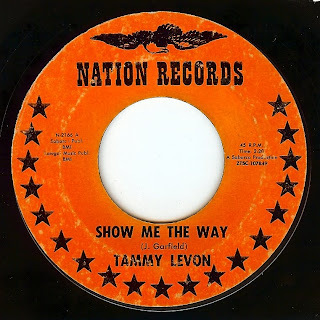 An excellent song and performance that has one foot in the blues and another in the rapidly developing soul styles. The two top reasons why so much modern music leaves me cold is a) the lack of creativity in songwriting and b) the use of devices like auto tune which completely strips the soul out of music by making it sound as if it were recorded by droids. Take this record for example; full of dynamics and excitement and one fiendishly out of tune guitar. I dig it though; that discordant sound just adds to the overall power of the record! Add this to other pitchy masterpieces such as the first Velvet Underground LP, Stooges Raw Power, and anything released by the Troggs. Auto tune? Give me AUTO OUT OF TUNE any day if it means bringing excitement back to music. No surprise that these two fellas got their start singing in church (nd they are not blood brothers; their names are Richard Dunbar and Jimmy Diggs). 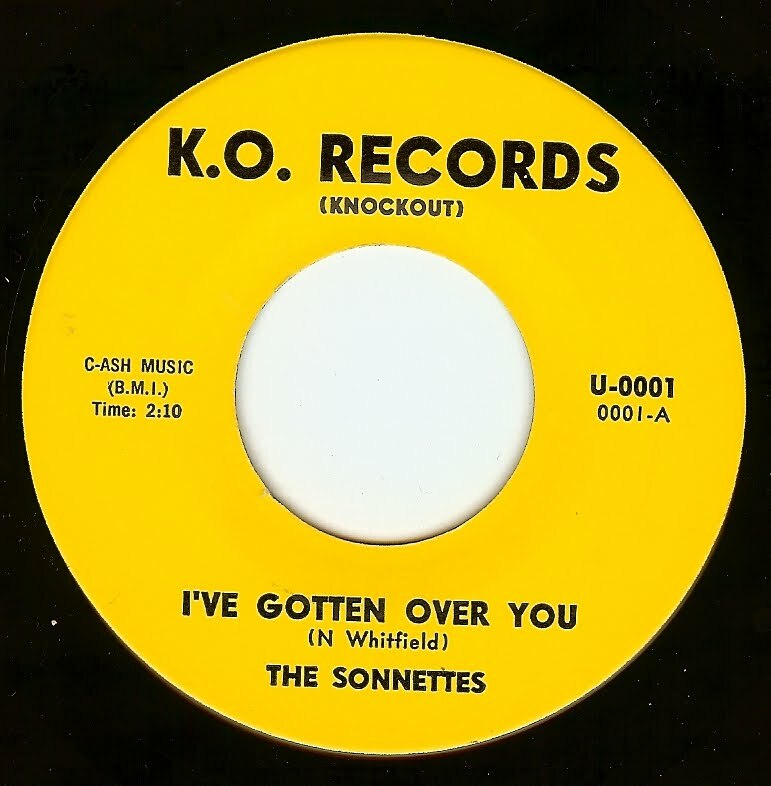 The group was formed in Washington DC as a spinoff to their teenage doo wop group the Starfires. 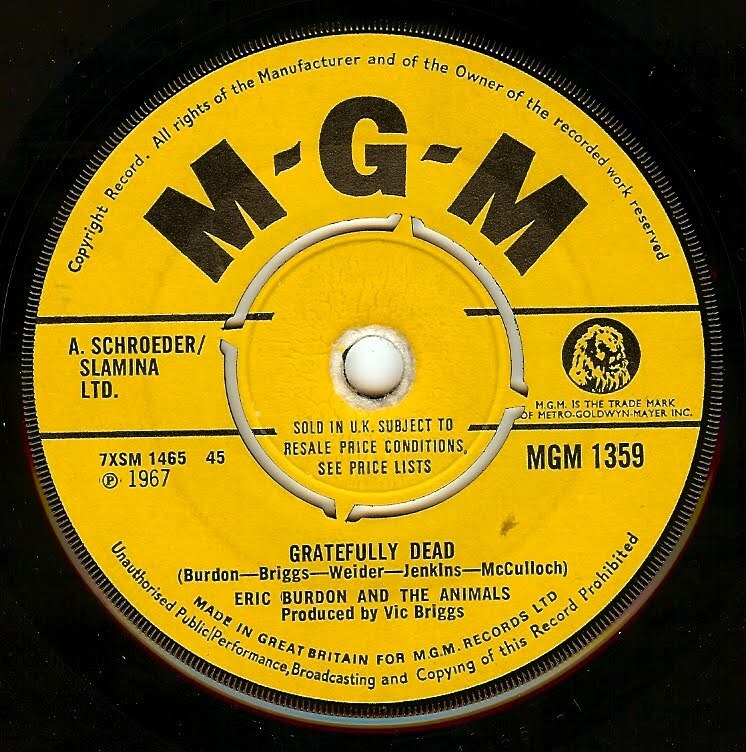 Directed by the great Bert Berns, this jaw-droppingly great song is beyond ANYTHING I could write a description for. Here's one for all of those who are suffering through the heatwave! 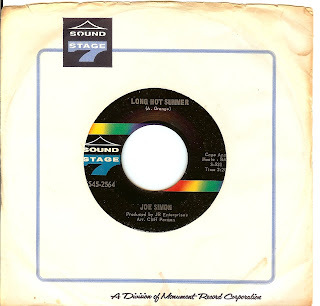 With a SMOOTH rich voice, southern soul giant Joe Simon definitely turns in a hot performance that's a 2:20 trip into a hot, humid kind of day where a cold drink of your choice and great tunes like this are just what's needed to feel a little bit cooler. 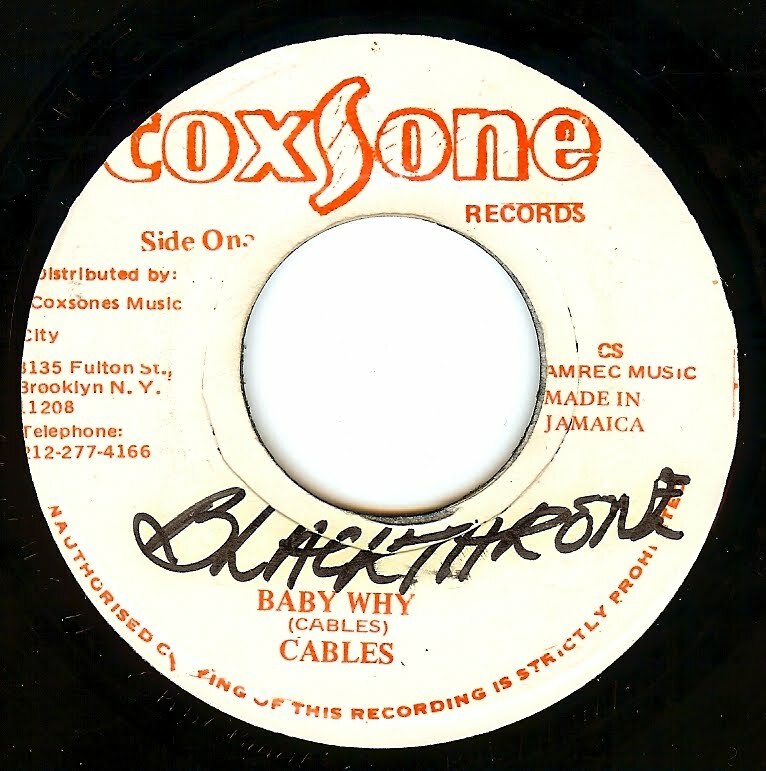 While I have quite a few collections, box sets and LP's of early reggae, I have never collected the 45's as I feel quite overwhelmed by the massive amount of 45's out there (and I'm already overwhelmed by the staggering number of soul and beat 45's that I'm still seeking out and discovering). 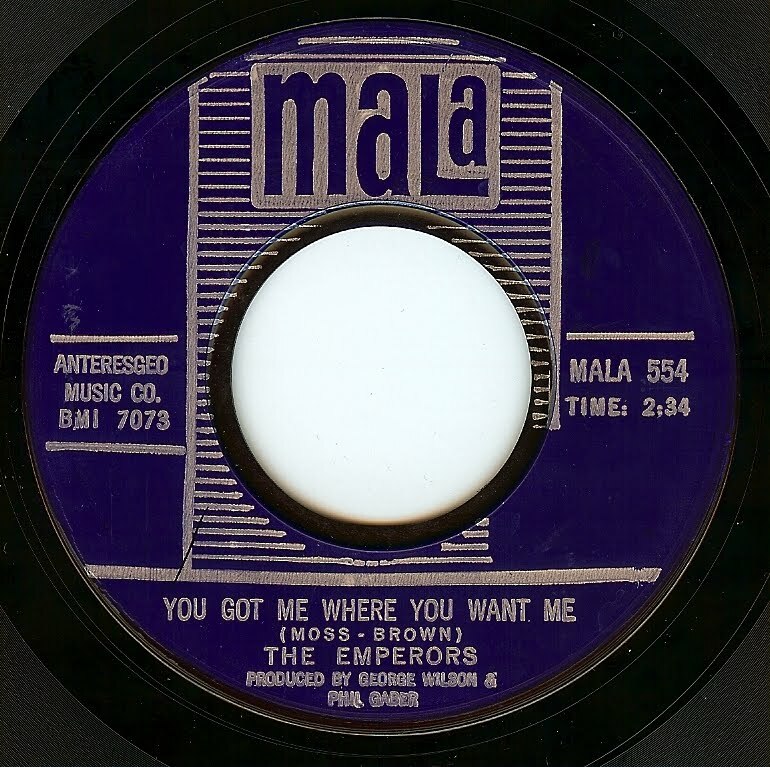 However, I was recently in Toronto and luckily, on the same day I was there, a record show was on and I found a nice stack of 60's/ early 70's reggae 45's for a good price. 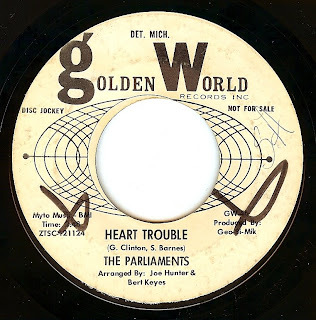 The Cables were led by Keble Drummond, and the group name was a play on his name, and also the fact that there music was "like a cable around the world". 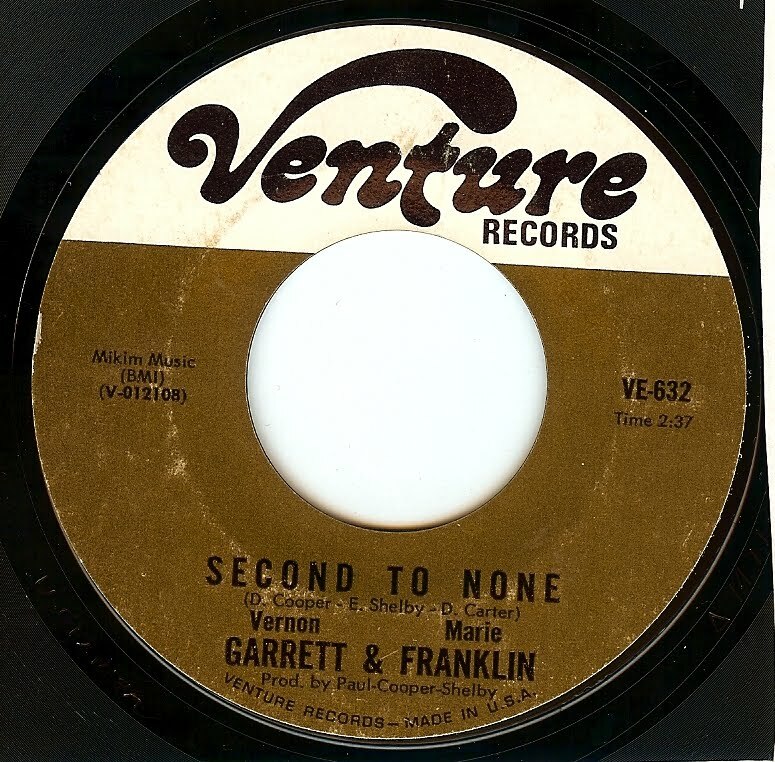 A sublime track with absolutely mesmerizing harmony vocals. Yet another record that was simply lost in the shuffle of the talent pool of Chicago soul. This is technically the b side of minor local (Chicago) hit "A Schoolgirl's Dream" but I find this to be a much stronger song. 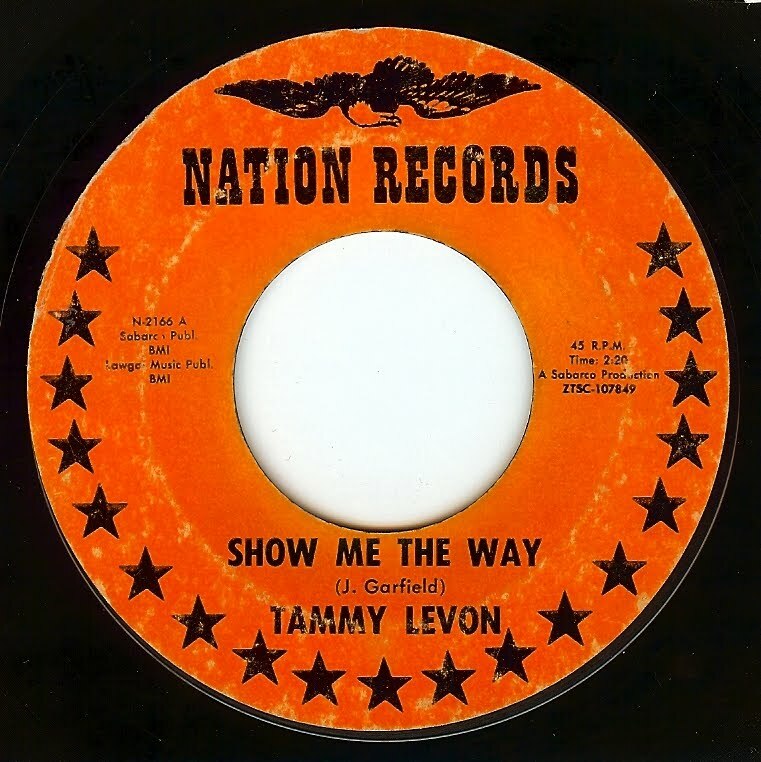 Tammy released at least one more record, but other than that, I cannot find any more info. 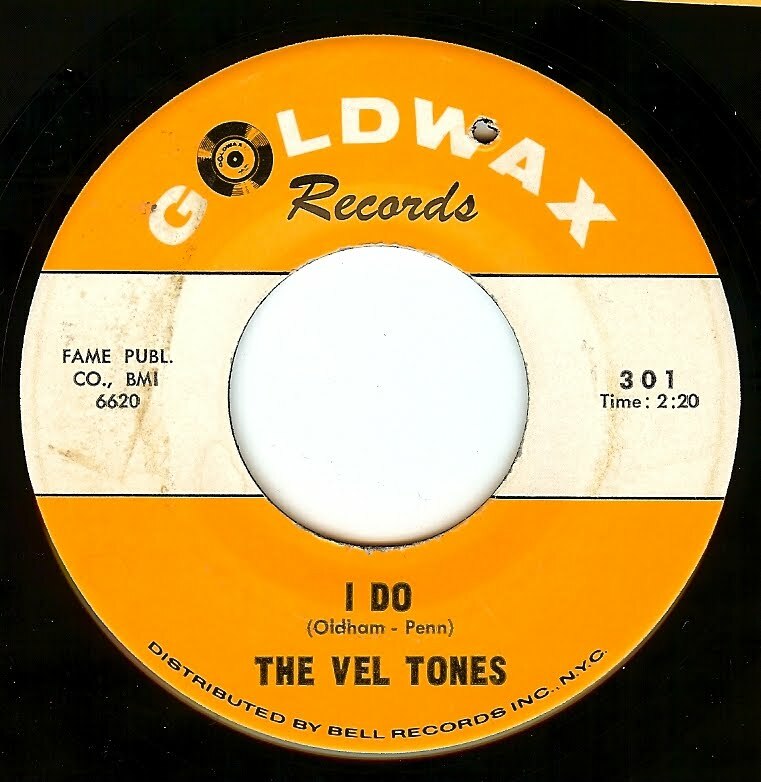 Not sure if this is the same Vel Tones that recorded for Satellite (out of Memphis) in 1959 (then later cut a single for Stax as the Canes in 1967; A record that has been on my want list for many many years as a matter of fact. 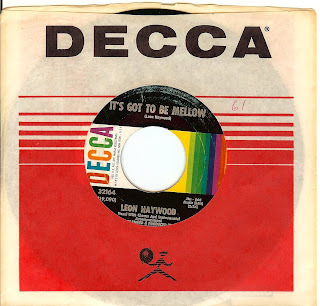 One of the hardest Stax singles to find!). It would make sense, as this sounds like it could easily be a Memphis record. 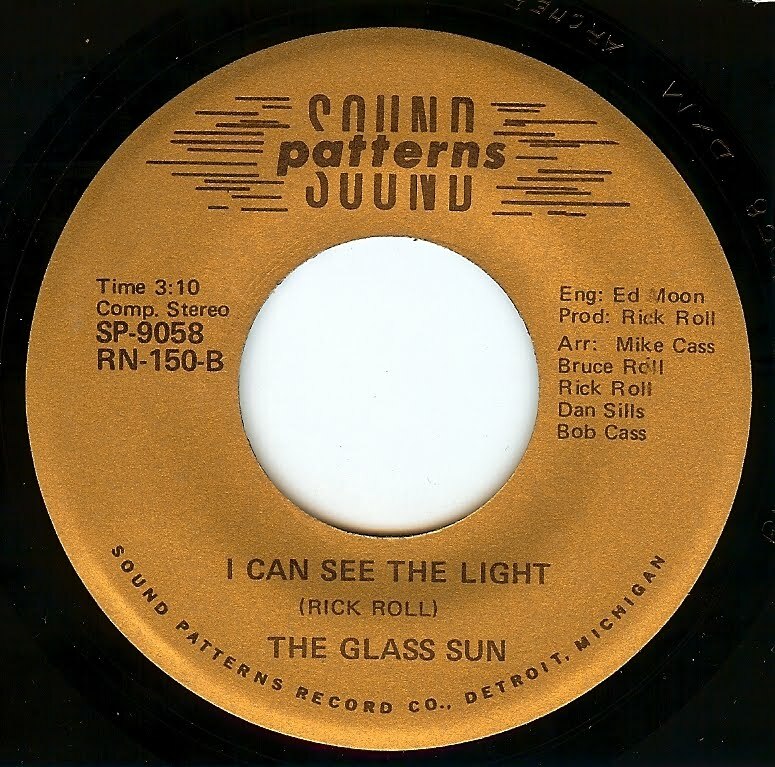 Here's an incredible psychedelic track from Ypsilanti, MI (near Detroit) group The Glass Sun; cool to see that this group has a myspace page and still occasionally performs to this day. Hopefully the fuzztone they used to record this track is still in working order! 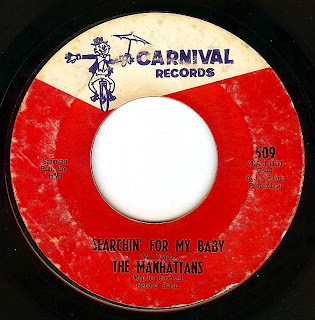 I first heard this at this year's MOD Chicago, where my man Brian (aka ace DJ "The Midnight Cowboy") played this gem of a jam and I had one of those "little record, where have you been all my life?" moments. First thing I did when I got home was to procure a copy of my very own! 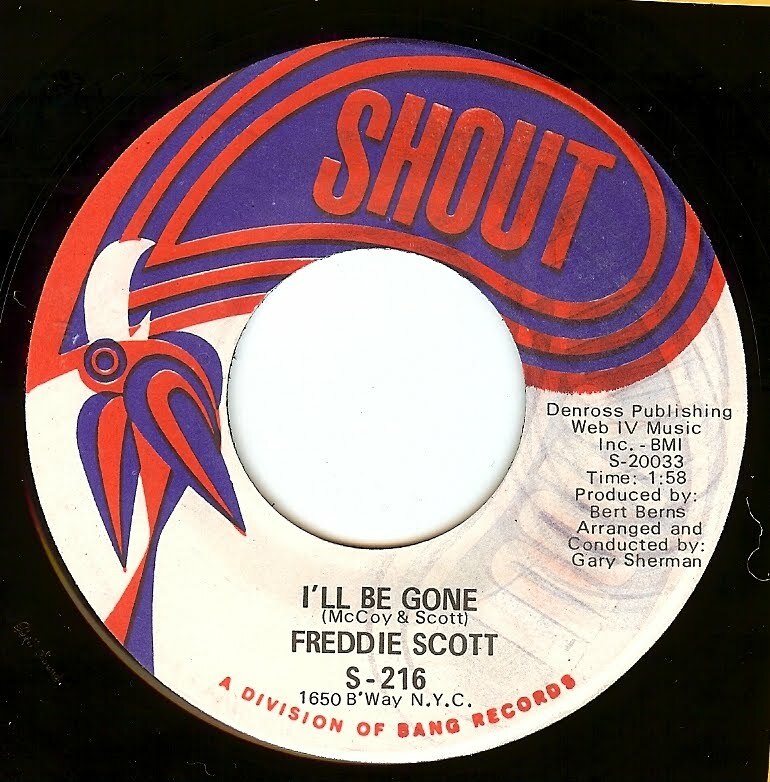 Shortly before their smooth, Philly soul period, Harold Melvin & company recorded this all out burner. 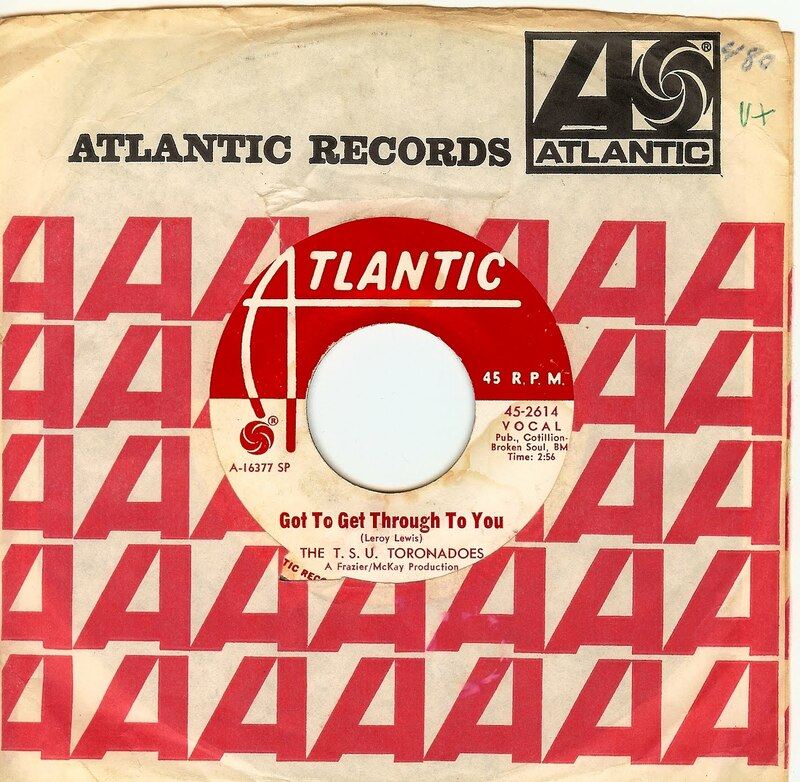 What we have here is, quite simply, one of the hottest ever double sided records of the uptempo funky variety. Possibly the only release from this Harrisburg, PA group. What vocals; have MERCY!! !